Winter, are you here? The people of Memphis are a bit confused. With spring right around the corner, why are we talking about snow and cold? We're here to give you the answers straight from Mother Nature herself. But first, we have to start north. While Memphis sits under cloudy skies and chilly temperatures, the Northeast into New England are being plowed over by a strong nor'easter. This type of winter storm, named for the winds often associated with them, is bringing high winds and heavy snow across the region. Some areas are picking up over two feet of the white stuff, burying cars and knocking out power along the way. The GOES-East satellite shows the strong comma-shaped structure of the nor'easter slamming the Northeast and New England. What does this mean for the Mid-South region? Cold air has funneled in behind this system, prompting Freeze Watches and Warnings around our area for the next two nights. With clearing skies and less clouds in the air, temperatures will fall off significantly, and the same is possible tomorrow. 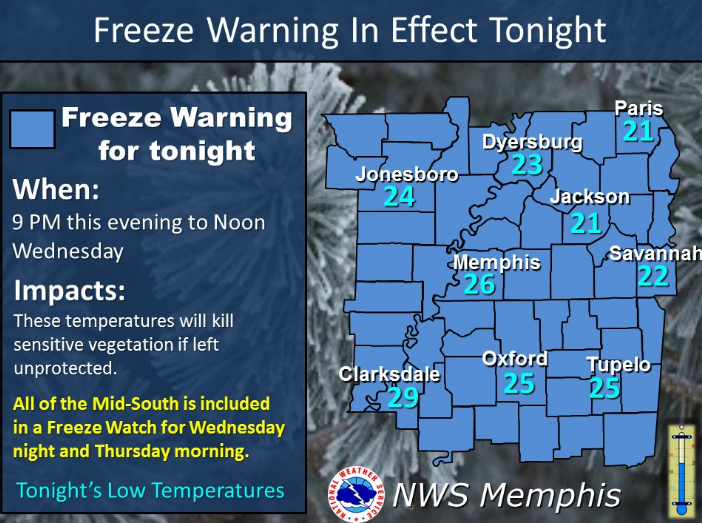 Mid to upper 20s are possible around the area on Tuesday night, including in Memphis proper. While highs tomorrow only hit the low 40s, overnight lows on Wednesday night rebound slightly to near 30. Make sure you are prepared for the cold these next two nights. Protecting the three P's will be essential - your plants, your pets, and your pipes. Plants especially that are left outdoors in these below freezing temps will be severely damaged by the unseasonable drop. 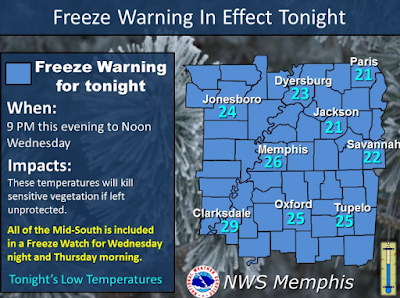 The National Weather Service Office in Memphis pushed out this graphic on Tuesday evening. Key takeaway - bring your plants indoors or cover them if you want them to stay alive. The cold air begins to push out of our picture by Thursday, as highs rise into the 50s and lows only drop into the 40s with overcast skies. However, with that warm-up comes the chance of rain to close out your week. A chance of showers builds in on Friday and continues on Saturday. These will likely not completely wash out the start of your weekend, but keeping the umbrella or rain jacket handy wouldn't hurt. Temperature wise, the approaching low-pressure system will usher in warmer air from the south and southwest, progressively bringing temperatures back to normal. Highs on Friday will reach to near 60, and Saturday will hit the mid-60s. The National Weather Service surface analysis for Thursday morning shows the potential for rain showers wrapping around the backside of high pressure and ahead of a weak low entering the Great Plains. As high pressure builds in behind the showers, Sunday will see sunnier skies and temperatures into the upper 60s during the day. That warming trend continues into the beginning of your work week, just in time for the students returning from spring break. Highs on Monday and Tuesday should both break 70 degrees, though a slight chance of storms rumbles in by Tuesday afternoon. March Ends Like a Lion or Lamb? After March rolled into the Memphis area like a lion just a few short weeks ago, will Mother Nature bring a more peaceful transition to spring? Temperatures look to remain above average, much like what we have seen in January and February. Rain chances, however, could be slightly below average to right on par for this time of year. Are you excited for spring? Before you know it, it will be April. And as they always say, April showers bring May flowers. Be sure to check our MWN forecast for the latest updates, all generated by the men and women behind this site. 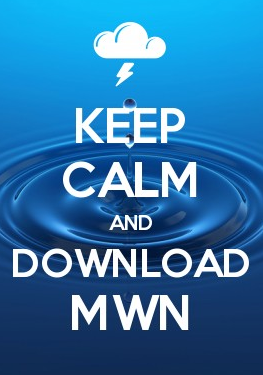 Also download the MWN app for weather at your fingertips, including StormWatch+, the best severe weather tool to give you pinpoint watches and warnings.